I've just released a new version of my Upload-to-Facebook plugin for Adobe Lightroom that can automatically tag people in photos you upload to Facebook. It requires Lightroom CC/6, which was released last week, and also the latest version of my People Support plugin, which now allows you to associate a Facebook account with people in your Lightroom catalog. 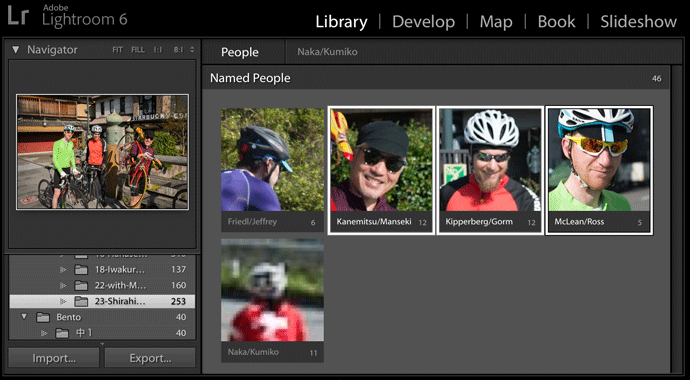 First, using Lightroom CC/6's facial recognition features, ensure that all faces that you want to tag are noted within the People view of the Library module. 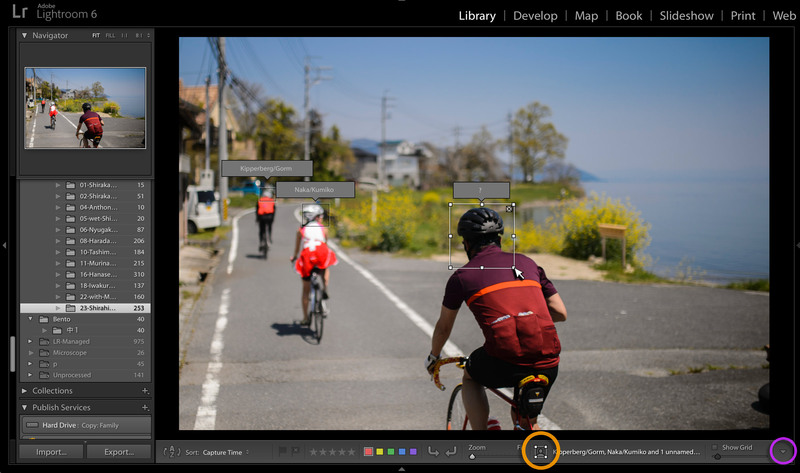 In the screenshot above, I'm in the process of drawing a rectangle around the back of the nearest cyclist's head, which of course wasn't automatically recognized as a “face” by Lightroom. Nevertheless, I want the cyclist to be recognized as a Person in my catalog, and to be tagged with his name at Facebook. The “Draw Face Region” tool is available only in Library's Loupe mode (the keyboard shortcut to bring up Loupe mode is “E”). The tool is enabled via the bust-in-a-rectangle icon on the toolbar, highlighted with the orange circle near the bottom of the screenshot above. If you see the toolbar but don't see the face-region tool icon, either your window is not wide enough to show the icon, or you've not enabled it for your toolbar. In either case, you can adjust things to your liking by using the little down-triangle icon at the far right, highlighted with a purple circle in the screenshot. There you can pick and choose what to show in the toolbar. When you enable this tool, face regions that have already been recognized are shown, and you can drag out a new region with the mouse, as I'm doing in the screenshot above. There, I'm about ready to fill in the name of the foreground cyclist; earlier, I'd drawn and named the background cyclists. I click on the highlighted button and paste in the URL for his Facebook profile page, and now I've got accounts associated with all the people in my next upload. I make sure that “Remove Person Info” is not enabled, and proceed with the upload to Facebook. The result is an album filled with photos with my friends already tagged. Really love this feature, so glad you’ve integrated it when Adobe didnt. Is there plans for the future where we don’t have to manually enter the profile URL – as it could be taken from the name tagged? Same with the birthday? Thanks for all your plugins, I use several of them and find them very useful! What would be really cool – would be if it could work backwards to that – when friends tag someone in your facebook photo the person / face region gets the tag on lightroom as well. I’m guessing that’s going to be 1000 times as difficult to do though! I don’t see the plugin extra to do this in the latest version. Am I missing something? I’ve tagged several students from a class I teach. These students are not currently my Facebook Friends although they do have Facebook profiles that I linked using the People Support plugin. Facebook doesn’t seem to recognize the tagged individuals when the photos get published. Do tagged faces in Lighroom have to be my Facebook Friends for the tags to get properly recognized by Facebook? Hi Jeffrey, thanks for the possibility to tag people during the upload process, that really saves me time. One Question, though: I try to tag peoples pages instead of persons, because I often work with professionals that want to separate their private and business FB life (as I do). Do you know the reason or can make it work? Facebook released the ability to tag kids that don’t have facebook accounts via the scrapbook functionality. I can’t figure out how to get to the right “profile url” for you plug-in so that the photo gets tagged correctly in Facebook. Perhaps it is something not yet supported by your plugin? How can I transfer the basis of names and links Facebook from a computer to another ? ?